Smart Switch No Neutral: How can you install a smart switch with no neutral wire? Can you install a smart switch with no neutral? In some instances yes, but it depends on what smart light switch you are using. Most smart lights switches require a neutral but there a few smart light switches that don’t require a neutral. We cover what smart switches work with no neutral or your other options for installing a smart lighting with no neutral. You have several different options if you are trying to install a smart light switch and you don’t have an existing neutral in your switch box. You can use a smart light switch that does not require a neutral wire. The best light switches that don’t require a neutral wire are the Lutron Caseta Dimmer Switches. The Lutron Caseta dimmers will allow you to control your lighting with your phone or can be connected to Alexa for full voice control of your lighting. 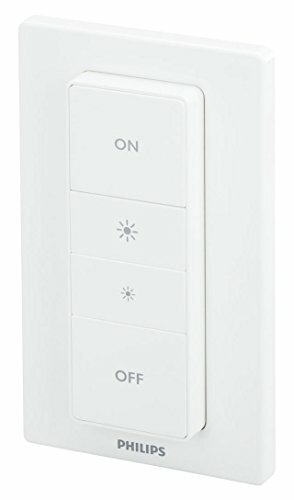 The lutron caseta dimmers are easy to install, don’t require a neutral and connect to a lutron smart home hub that will connect the lights to your wifi network and allow you to add other lutron smart home devices to your home in the future. The diagram below shows the wiring diagram for a smart light switch with no neutral. With a lutron caseta light switch you just remove the old light switch, and install the new smart light switch with the exact same wiring as the original light switch. Even if you have a neutral in your switch box and you end up installing more smart light switches you don’t need to wire the smart light switches with the neutral, which will save you time wiring your new smart light switches. You typically get the best value buying a lutron package with the hub, a few switches and remotes included in the package to get you started. From there you can add on additional remotes and switches as needed. What is nice about the caseta system is that you have switches that you can install anywhere you have a hardwired switch but if you want to add additional “switches” in your home to turn on an off the lights from another wall in your home you can do so with the “pico” remotes. Which look and act like traditional switches but are completely wireless. They even fit in existing wall switch cover plates to look like a fully built in switch and they don’t require any wiring. The wireless pico remotes will run for 10 years before the battery needs replaced and are a great solution to add additional functionality to your home without the headaches of wiring. If you don’t have an existing neutral wire the lutron caseta system is a high quality system that will allow you full smart home control from your phone or with your voice using amazon alexa or google home. If you end up connecting your lutron smart switches to Amazon Alexa you can control your light switches using the voice commands below. Adding voice control to your smart home adds a whole new level of luxury to your home and is simple to do once you have installed the light switches. To connect your Lutron Dimmer Light Switches to Alexa you will need a compatible Amazon Echo Device and you will need to set up your Echo Device using the Amazon Echo App. Once your Echo Device is set up you will then need to go into the Amazon Alexa Skill Store and enable the Lutron Skill to connect Amazon Alexa to the Lutron light switches. 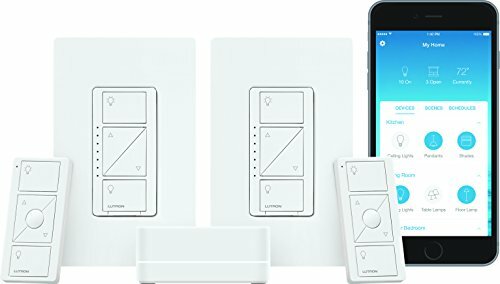 The Lutron Dimmers can also be connected to google home devices to enable voice control of your smart lights. With the Lutron Caseta Hub you can also control lutron smart automatic shades. You can pull a neutral wire into your junction box by adding new wiring. You will need to use 3 pair conductor cable like this this Romex Cable on Amazon. Pulling a new neutral wire is not for the faint of heart and will most likely require that you open up walls to pull the new wiring. Sometimes you can run your electrical wiring through your attic, basement or crawlspace and then up the wall to conceal the wiring. If you have access to run the wiring it is much easier but routing the wiring through the wall can be a challenge. If you live in a state or municipality that requires all wiring be installed in conduit it can sometimes be slightly easier to run a neutral wire as you can “fish the wire” through the existing conduit circuit to a place where the neutral can be properly connected. If you pull new wiring through your home you will need to have a new neutral wire in each switch box as shown in the diagram below. If you add the new neutral wire you wiring will be compatible with just about every smart light switch on the market. If you house was built after 1980 there is most likely a neutral wire already in the electrical box and you don’t need to pull any new electrical wire. You can just tap into the existing neutral wire into the electrical box. But with older houses unless they have been updated you really won’t know until you open up your light switch to take a look. If you plan on installing new in wall wiring having a reliable fish tape or pull rod will make getting the wire where you want it easier and a small inspection camera can be helpful for finding the wiring you are pulling in wall. If you don’t feel comfortable doing electrical wiring or you don’t want to do any wiring there is a very easy option to adding smart lighting to your home without touching a single tool. You can install Philips Hue light bulbs which don’t require any smart light switch installation. You can install everything by hand with no tools required. Philips Hue smart light bulbs work by just removing your old light light bulb and screwing in your new Philips Hue smart light bulb. Once the light bulbs are set up you can turn on or off the light bulbs with your phone, you can dim the light bulbs with your phone or you can control your Philips hue light bulbs with Amazon Alexa or Google Home. Phillips makes two primary versions of their standard smart light bulbs. One version offers all of the smart features of on/off, dimming control and Amazon Alexa control in bulbs that are standard white color. The other version has all of the same features but also can change between millions of different colors so you can get white, blue, red, green or any other color you can think of through your smart light bulbs. The standard white light bulbs are typically cheaper than the color changing light bulbs and the best value is typically if you buy at least a 4 pack of smart light bulbs. There is no wiring required with the Philips hue light bulbs you just screw them in and set them up. You can also add Philips hue smart light switches & remotes which can be placed just like light switches anywhere in your home. You just take the remote out of the box, peel off the adhesive and place it directly on the wall. Once installed they look built in just like any other light switch. Another great feature of the Philips Hue Light Switches are that the remotes are completely detachable and magnetically stick on the wall . 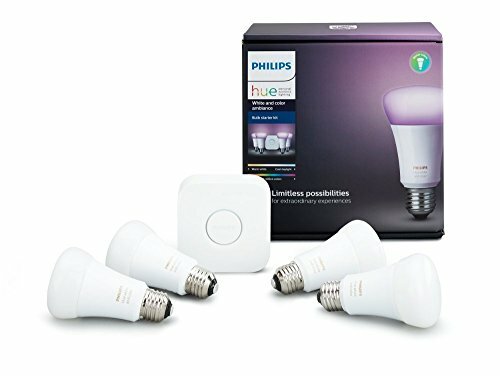 To set up the your Philips Hue Bulbs you will either need to purchase a Philips Hue Kit that includes the Phillips Hue Bridge or one of the Amazon Alexa Devices that has the Philips Hue bridge built into Amazon Alexa. The New Echo Show and Echo Plus both have built in Philips Hue Smart home hubs so you don’t need to purchase a kit if you choose to get one of these Echo Devices. If you purchase the kit with the Philips Hue Hub the smart lights will work with any Amazon Alexa Device. If you want to add smart lighting to your home but don’t want to do any wiring the Philips Hue Light bulbs are a great choice. If you go the route of installing Philips Hue light bulbs there are few things you should do to make them work better with your home. You should get the Hue remotes and pair them with lights in the rooms that you install the smart light bulbs. It will make it much easier to control your lights. If you don’t do this and you turn your existing light switch off it will turn off the power to the Philips Hue light bulbs and they will be disconnected from wifi control with your smart home hub. To prevent this from happening I recommend you put clear plastic covers over your existing light switches so you don’t keep turning them off. You can get the clear plastic switches for newer flat light switches or for old style rocker switches. You should also install Amazon Echo Devices in the rooms that you want to control your smart lighting. I find that I almost never use the actual light switches and just use Amazon Echo voice commands to control my lighting. In my home I use the Echo Show, Echo Dot, Sonos with Alexa built in and the Echo Spot to control my lighting. Don’t give up! One of the three smart light switch solutions above can work for you. You can give up, but then you won’t have any smart home control of your home. But on the plus side it takes no skill, doesn’t take up any of your time and doesn’t cost a dime. Don’t give up, pick one of the 3 options above to automate your lighting based on your skill level. If your home was built after 1980 you can most likely install any smart light switch because your light switches do have neutral wires built in. We recommend you install our smart light switches that work with Alexa and Google Home because they offer luxury and simple integration without any home hub to Alexa and Google Home. Does Alexa Work With Ring? Smart Doorbell Guide, Which Smart Doorbell Should You Get? Smart Home Amazon Alexa Guide, Which Echo Device Is Right For You?